While working in the front garden today I thought it might be a good idea to start giving a little history behind some of them. While the gardens here are really only about 6 years old the cottage has been here for over 40! My husbands family built the cabin as a vacation home in 1968 and now Steve & I live here full time. It’s right on a lovely lake in west-central Vermont with a hardiness zone of about 4-5. So I can winter many plants very well…usually. We are under large pines, hemlocks and spruce trees with a nice stream running right through. Mostly the stream is nice except for when it overflows as it has done a few times since I’ve been here, as you can see from the photo below……this happened earlier this summer. But mostly it’s great. 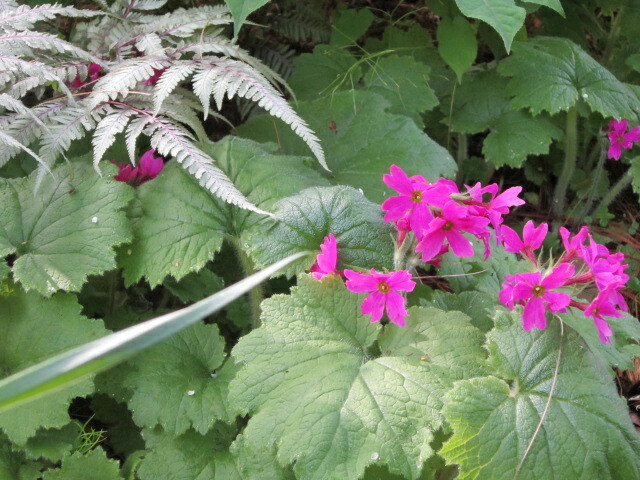 I can plant so many moisture-loving plants along its banks such as all the Primula I could ever want! The Primula Japonica are really spreading and seeding in quite a bit creating a beautiful late spring show! The Primula kisoana are also spreading well into lush patches of large felty leaves and with the brightest magenta flowers in the spring. Here it is with a nice Japanese Painted Fern in the front garden. This garden began as a narrow strip along the foundation just full of Pachysandra japonica and a couple of boring Hollies of some sort. That all came out and was gradually replaced with loads of compost which the soil so badly needed. I started planting a few Epimediums, Hosta and of course Primula right away. This garden gets only afternoon sun so the plant selection had to be able to endure a few hours of bright, hot sun. The soil dries out pretty quickly because of the large Pines nearby so I am adding compost and organic mulch pretty continually. But most of the plants here are really thriving! This photo was taken today while I was finishing the edging, composting & mulching. Every year when I edge I come out another 6-10 inches so this garden is gradually getting quite large. You can see how the plants towards the front are still pretty small as they are the newest planted, with the ones further back have been in a few years now. 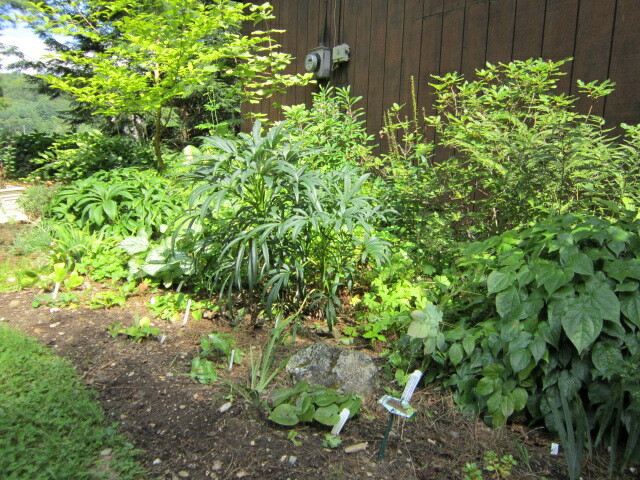 The large dark green plant at the center with the longish leaves is a Helleborus foetidus ‘Sienna’ that I grew from seed. The leaves are so dark green and the plant is so big and beautiful I don’t mind that the flowers never really make it through the winter. The tree towards the other end is a Stewartia pseudocamellia a lovely small, flowering tree with smallish white flowers in June that resemble a Camellia. 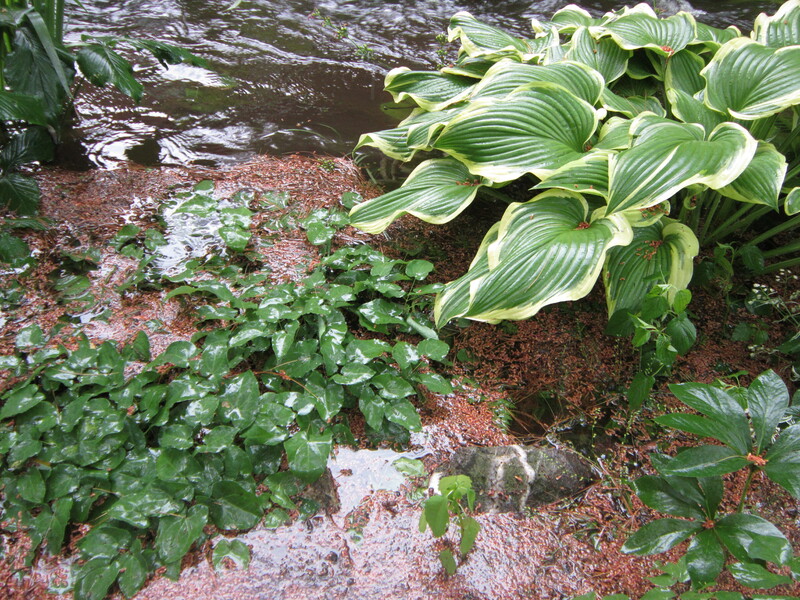 It also has exfoliating bark that adds interest to the winter garden. I have been adding lots of Hepatica to this garden along the front edges, some of them I picked up at the huge plant sale in Portland, Oregon last spring called Hortlandia. It was at the Expo center where the APS National Show was also held. I came home from that with so many plants I had to ship 2 boxes full through the mail! 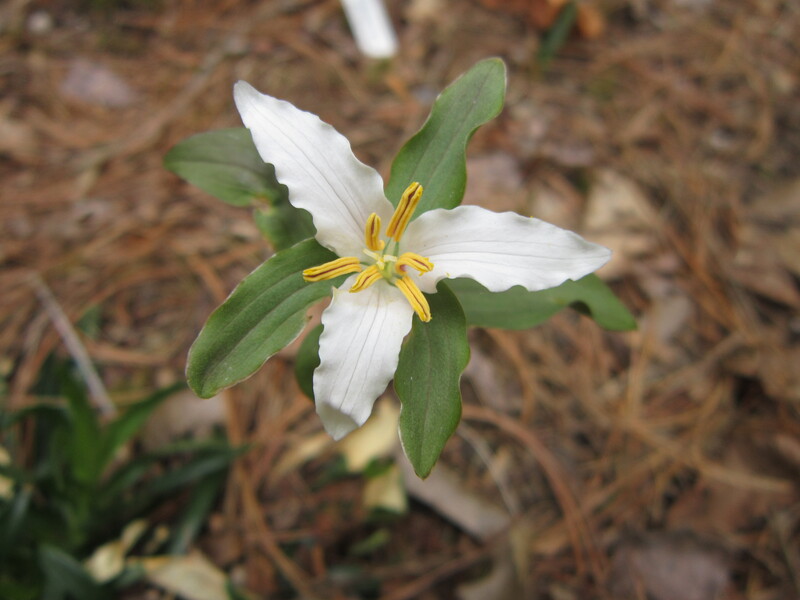 There are also a few Trillium here that are doing well and one T. pusillum is spreading pretty quickly! I have already divided it once and spread the divisions around. It’s small but it’s so pretty and holds its flowers upright so you can take it in without bending over to see it. Today I finished cleaning up this garden, but now with the added room from my edging job I need to go through my trays and trays of plants to see what will get planted here. There are so many….I’m thinking I will add a few Viola pedata, the bird’s foot violet and perhaps a few more Primula. Because you can never have too many Primroses! !